Forster supports Opel's sale to Magna. BERLIN -- Opel Chairman Carl-Peter Forster left open questions about his future role at General Motor Co.'s European unit at an industry conference here. 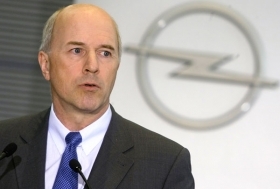 Media reports have suggested that Magna International Inc. executive Herbert Demel could become head of Opel if GM decides to sell a majority stake in the German-based unit to the Canadian supplier and its Russian partner Sberbank. Forster, who is also president of GM Europe, said he and Magna co-CEO Siegfried Wolf decided to focus on finding a solution for Opel before the carmaker's management roles are decided, adding that he "wants to reserve the right to decide" on his future. Forster said he supports Magna's bid to take over Opel. Under Magna, the New Opel would have better access to strong growth opportunities in Russia while keeping close technical cooperation with GM, Forster told the Automobilwoche Congress Tuesday. Citing Magna sources, German weekly magazine WirtschaftsWoche on Sunday said that Magna's Wolf wants Demel, a former CEO of Fiat S.p.A.'s auto division and Volkswagen AG's Audi premium brand, to head Opel. Demel is Magna's chief operating officer in charge of vehicles and powertrain at Graz, near Vienna, Austria. GM's board is scheduled to meet Tuesday to reconsider it decision to sell a 55 percent stake in Opel to the Magna consortium. The deal was agreed to in September but was called into question last month after European Union competition authorities expressed concerns about the fairness of the bidding process. Forster said if GM decided to sell Opel to Magna, it’s likely the deal would not be finalized until around Christmas. The deal had been expected to be signed in early October, with the closing planned for the end of November. Opel has liquidity until January, Rainer Einenkel, who chairs the works council at Opel's Bochum plant in Germany, told Automobilwoche last week. Automobilwoche is Automotive News Europe's sister publication. The German government provided 1.5 billion euros of aid to Opel in June to keep the carmaker afloat when GM went into its short-lived bankruptcy in the United States. The money was due to run out November 30 but Opel's finances have been helped by improved sales due to Germany's scrapping bonus and the success of the mid-sized Insignia, which is the reigning European Car of the Year.